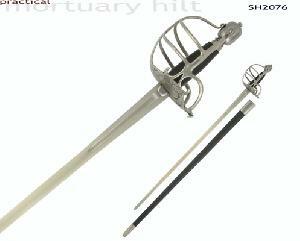 The Practical Mortuary Hilt Sword (SH2076) is built for the re-enactor. The basket is identical to that of the SH2004 but the blade is unsharpened, with 1/16” edged and a rounded tip, complying with the combat rules of many re-enactment societies. See page 55 to view the Functional Version of the Mortuary Hilt Sword!